A survey is strongly recommended before buying, subdividing, improving or building on land. 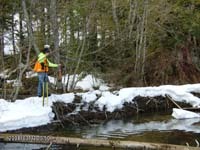 Surveying the parcel before these activities ensures that the expense and frustration of defending a lawsuit, moving a building, or resolving a boundary dispute can be avoided. A boundary survey determines the property lines of a parcel of land described in a deed. It will also indicate the extent of any easements or enchroachments and may show the limitations imposed on the property by state or local regulations. A Boundary Line Adjustment is a minor moving of a lot line(s) between two or more parcels. A land survey with especially stringent requirements. The survey is specifically designed to satisfy the needs of lenders, corporations and title companies when dealing with valuable commercial properties. The subdivision of land solely for transfer to a member or members of the immediate family. A request to FEMA for re-determination to remove property out of the flood plain.